Engagement rings are very special to women as they depict eternal love and the delightful acceptance of a lifetime commitment. Understanding the significance of this event, B2C Jewels has designed this guide to create a better understanding of the ring you select. Under the great Pope Nicolas I, a law was made in Rome stating that a groom needs to provide a gold ring to his bride which would act as a security talking about the groom’s financial soundness and also imply the fact that the groom has paid for his bride. In ancient Egypt, engagement rings were worn on the ring finger of the left hand because it was considered to have the "vein of love" connecting directly to the heart. In ancient Greece, the ring was considered to be more of a promise or commitment ring between lovers, friends and even masters and slaves. In catholic tradition, the priest consecrates the ring, after declaring it "In the Name of the Father, Son and Holy Spirit". The history as to how use of diamonds started in engagement rings can be traced back vaguely to as early as 800 BC when they were first discovered in India. All throughout history, diamonds were considered as a symbol of strength and thus found homage as an inseparable element of engagement rings because of their extreme hardness symbolizing eternity and the circular band symbolizing unity in hopes of an unbreakable marriage. Deciding the amount to be spent on engagement ring is always a tricky decision. Your estimate should be an outcome of three inter-related stimuli- employment status, credit standing and financial status. This process should be independent of any preconceived notion of engagement rings shown by fashion magazines and designers. 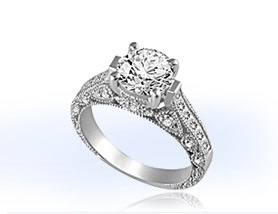 The permanence of the engagement ring in a woman's attire makes it absolutely essential that the woman should like it. You can either let your lady select her own engagement ring or try to examine yourself her likes and dislikes and select one for her, incase you plan to surprise her. Be attentive to the choices of your woman. Check out what she admires while the two of you shop around together next time. Discuss it with her close friends or family members to understand her expectations better. Observe the kind of jewelry that she wears- delicate or bold design, the kind of metal and so on. You should also understand the work requisites of your lady. Do not pick a huge bold ring to clash with her formal attire if she is in a corporate environment. Now your Engagement Ring Hunt can begin with the initial step of looking around for what is it that's in, surfing the internet, browsing through magazines and checking for desirable designs around. Train your eye to the vogue- the metals that are used, the gemstones seen more often, latest designs, etc. 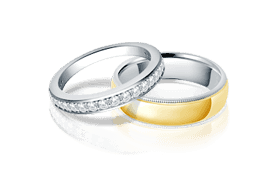 Solitaire Rings (Diamond Engagement Rings with a Solitaire)-If a classic diamond engagement ring is something that you have in mind, there is nothing better than a Solitaire ring. It has always been one of the most popular choices for an engagement ring. The solitaire diamond engagement ring is essentially a ring with just one diamond held in four to eight claws of prong setting. Prongs may be made of platinum, a very strong and beautiful metal that hold the diamond safely in place. Being platinum the claws look extremely thin, thus allowing light to penetrate from all sides and leaving more of the diamond visible. Diamond Accent Rings (Diamond Engagement Rings with Side Stones)-Side stones are typically set into a diamond engagement ring using different settings, which protect the diamonds while leaving a smooth edge. It’s a great option for women with active lifestyles. The side stones also accentuate the center diamond. Diamond accent engagement rings carry a stylish elegance celebrated since ages by tasteful women. 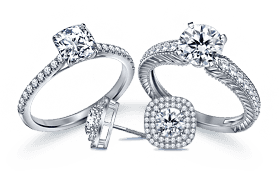 Three Stone Diamond Rings (Diamonds Engagement Rings with Three Diamonds)-These engagement rings incorporating three diamonds are also known as past, present and future rings, symbolizing the time-transcending power of love. These types of engagement rings typically integrate a center-piece diamond with two smaller diamonds, or other stones, on either side. A three diamond engagement ring could carry different diamond shapes on different designs. 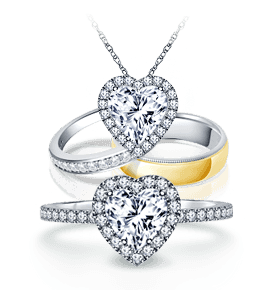 Matching Bridal Sets (Diamond Engagement Ring Sets)-A set of wedding and engagement ring makes a perfect representation of your love. The combinations of rings are unlimited. It could be contemporary designs or antique styles. Excellent bridal sets may include a combination of solitaire rings, diamond accent rings, three stone rings, diamond eternity bands or anything that blends well with the other ring. ShapeThe ones chosen by most brides are round diamonds. However, there may be exceptions and your bride might be one of them. A good choice may also be an elongated marquise, oval or pear-shaped stone, or even a square or emerald cut diamond. Fancier shapes, such as hearts, are another option. Quality-The brilliance and value of your diamond depends completely on the importance you lay on the 4 C’s of a diamond that represent the four basic qualities of a diamond and determine its value. For more information on the 4 C's of a diamond, view our Diamond Education section. The metal color should always compliment the diamond that has been selected, as the metal has a major impact on the color and brilliance of diamonds. While the choice of metal color is more or less determined by the on-going trend and personal taste, its cost is also a major determinant. But if your woman has a strong liking for white gold or platinum, you can just go in for it without even looking at yellow gold settings. To learn more about metals, browse our Metal Education section. Prong Setting - The prong setting, also called as claw setting, is widely used in diamond rings and is most commonly found in solitaire rings. Bezel Setting - Bezel set ring tends to make the diamond look larger owing to the way it is mounted. Also it is the best setting to be used if you plan to mask or enhance the color of your diamond by the effect of the metal color. Pave setting - Pave setting is an apt choice if bold design and huge ring are your priorities. The close layout of diamonds creates an illusion of one big diamond and also gives the impression of size. Illusion setting - Illusion setting, also called the invisible setting due to its nature of mounting, is the best option to opt for if a large diamond is your expectation and budget a concern. Once the ring has been decided and finalized, its time to check the finger size of the hand that the ring would crown. As the ring is to be worn life long, it has to be comfortable and of proper size. Measuring the size of the finger is a very simple task- Visit our Find Your Ring Size page and follow the easy-to-do steps mentioned there. Check out the splendid collection of Engagement Rings showcased at B2C Jewels.